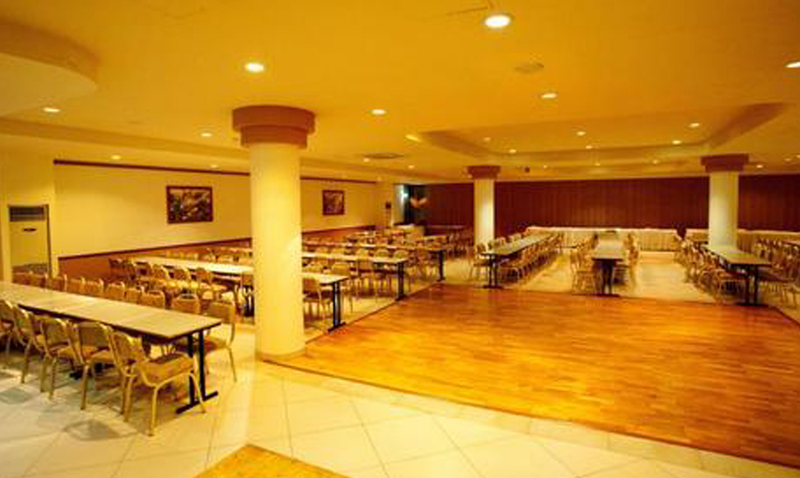 The Avanti Holiday Village is the new sister hotel to the well-established Avanti 4 star Hotel. It is situated 300m away, offering a very convenient location just 250m from the beach. The village is built on a 94000 sq. m. plot and stands out with its distinctive Mediterranean architecture and the beautifully laid out spacious one-bedroom apartments. The atmosphere combined with the variety of facilities makes it a resort suitable for couples and families seeking a different style of holidays with more privacy and flexibility. 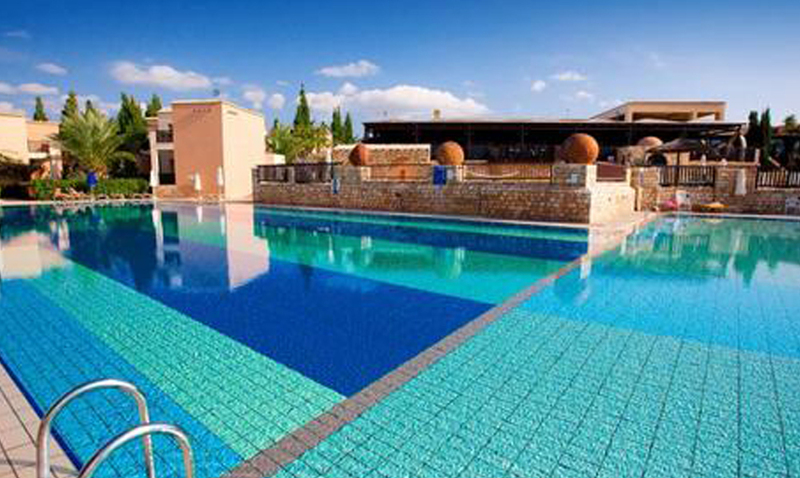 The Village has a prime central position, 15 min walk from the famous Paphos Harbour, 5 min by taxi to the old Paphos Town, and surrounded by shops, bars and restaurants. Each apartment has four normal beds: two in the bedroom and two in the living room that are also used as sofas. The apartment can take an extra camp bed. Apartments offer the following amenities: spacious terrace with table and chairs, en suite full bathroom with shower, fully equipped kitchenette with grill oven, mini-fridge, kettle, toaster and cooking utensils, individually controlled air conditioning/heating in each room, remote controlled satellite TV, music channels and radio, direct dial telephone, smoke detectors, wake up call, hairdryer, baby cot (free of charge), electric shaver outlets, safety deposit box (local charges apply). Disabled facilities include shower seats, grab rails and toilet raisers. 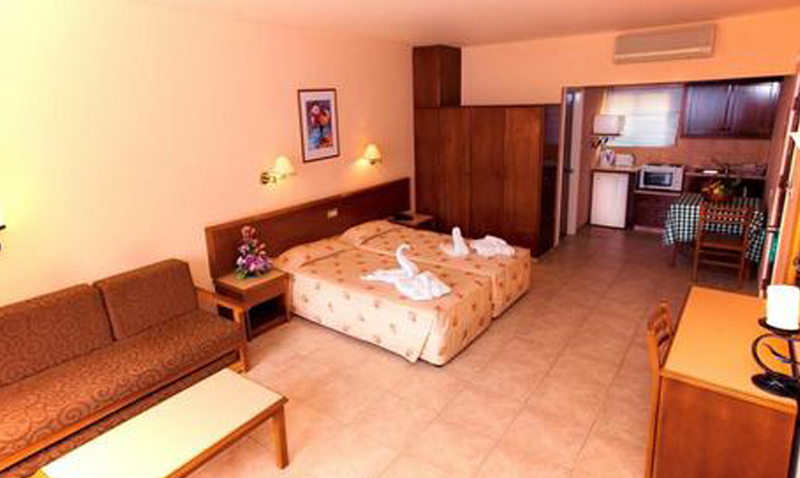 Doors are 86cm wide and there is good access throughout the hotel and the surrounding area. Please contact our sales support department for details of how to book a disabled room at this hotel. The complex offers self catering, bed and breakfast and half board meal options. There is a restaurant on site as well as a snack bar and a cocktail bar. 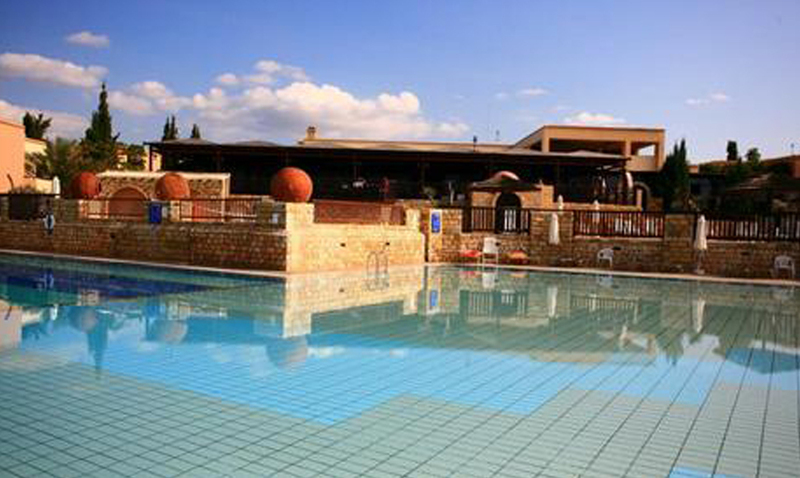 There is a 1200 sq m. outdoors freshwater lagoon pool with a swim up pool bar. For the children there is a large free form paddling pool, mini lazy river, as well as the popular adventure playground and a supervised kindergarten (4 -12 yrs). Free pool towels, sun beds and parasols. There is also an indoor freshwater heated (in winter) lagoon pool, floodlit tennis court, games room with pool table, aerobics room, archery and water polo. Available with extra charge: table tennis, fully equipped gym, two saunas, two steam baths-Jacuzzi, mountain bikes for hire, scuba diving introduction. There are three 18-hole golf courses at about 14 -20 Km away: Tsada Golf Club, Secret Valley Golf Club and Aphrodite Hills Golf Club. Guests are also welcome to use the Bowling Green facilities of the Avanti Hotel, 300m away, where six full sized artificial bowling green rinks are found, suitable both for flat green and crown green bowling groups (floodlit). Friendly games and competitions with local clubs can be also arranged, while equipment is available for hire. In the Avanti Village grounds there is a professional football pitch for teams to train where friendly games with local teams and referees are arranged.